I realized over the weekend that I havent’t made a $200 miata update in almost a year. And after seeing how nice AestheticsInMotion’s car is in person at the oppo meet, I decided to finally post an update on my pile. As of the last update I’d found an old early 2000's miata turbo kit in a relative’s basement. 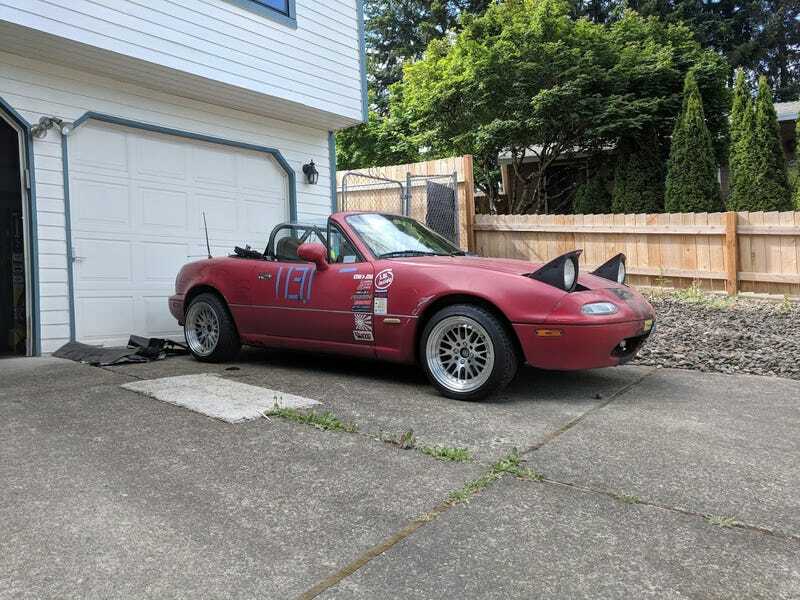 Well it turned out that it’s actually a 1.8 kit, so for now my cheapskate miata turbo dreams are on hold. The actual turbo is pretty neat, never put hands on a variable vane setup before, amazing that people were pushing close to 300hp on this little thing back in the early 2000s. Shown for reference below next to a Garrett GT28 housing. Both on the hood of the Miata which has doubled as a workbench area for for me over the past year. So, with the scope of the project shrinking a bit, I decided to give her a proper shake down at a local autocross. I picked up a cheap set of NB wheels off of craigslist to get rid of the 50lb 18" chrome wheels that came on the car, and replaced the three (!!) wheel bearings that those wheels had trashed. There was no way I was going to fit my marine battery into the stock location, so I traded off a little of the already limited trunk space for a proper mount. Once I got out there the car was a bit of a handful. The wet ground wasn’t helping, nor were the 8 year old all season tires, but the car was really slide-ey. And not repeatably so, it would react differently through the same course when given the same inputs. Still managed to do alright with a raw time squarely middle of the pack, but the car was fighting me the whole time. On the way home, someone flagged me down to inform me that my wheel was wobbling. Turns out, two of the wheels I’d bought had a pretty bad bend at the hub causing almost a quarter inch of toe change per rotation. The only thing I can think, is that the guy I bought the wheels off sideswiped a curb somehow without any curbrash. In any case, that explained the unpredictability when driven hard. I put the two stock daisy wheels with the most tread back on and the car felt a lot less sketchy at the next event. Brake fluid is good for paint, right??? I ended up taking it to cars and coffee a few times for a laugh along with the (at that point) three other friends from the BRZ scene who I’d convinced to buy cheap rustbucket Miatas. I continued to drive and autocross it for the rest of the year. At the last event of the season I gave it a little too much clutch kick to clear a pivot cone and the diff finally gave out. Actually I’m amazed it lasted as long as it did, the service records I’d found in the glove compartment indicated that a “chunk” had come out of the diff during it’s last service. Gave me a reason to finally put in the LSD that had been gathering dust. I probably should have replaced the subframe while I was there, but I didn’t particularly feel like fighting every single suspension bolt being seized on that day. Diff went in without much issue and performs pretty well (for a VLSD), but I haven’t had the chance to have it out on track yet. A few weeks later a seal blew in one of my front brake calipers. They had been feeling pretty mushy for a while, but I’d assumed it was air trapped somewhere in the system. I came out after work one day to find some fluid on my tire. Rather than bother with a rebuild, I just bought a new set of front calipers for right around $100. They took the squishy feeling brakes right away, in hindsight, that seal was probably on it’s way out the whole time I’d owned the car. I had to make a few of my own backing plates to mount it all up, but should be good to do some real tracks this year!